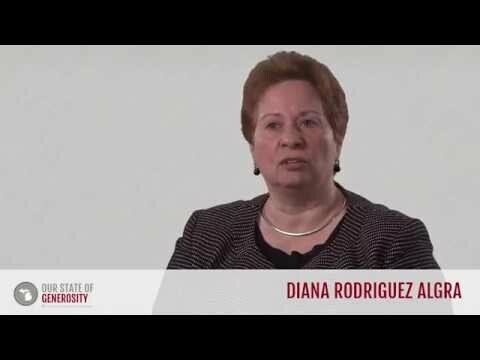 Ms. Diana Rodriguez-Algra led the creation and implementation of Michigan Campus Compact and the Michigan Community Service Commission. She has also been responsible for the expansion of Volunteer Centers of Michigan, a part of the Michigan Nonprofit Association. Ms. Rodriguez-Algra moved to Washington, DC, to help launch programs at the Corporation for National and Community Service, utilizing her experience with the successful creation of the Michigan Commission. Ms. Rodriguez-Algra has been an important leader of the volunteer component of Michigan’s philanthropic infrastructure since the late 1980s. Ms. Diana Rodriguez-Algra talks about her career in philanthropy. Ms. Diana Rodriguez-Algra talks about the collaborative nature of Michigan's philanthropic leaders. Ms. Diana Rodriguez-Algra talks about how leaders in Michigan have espoused a philosophy of servant leadership. Ms. Diana Rodriguez-Algra talks about the mission and development of Michigan Campus Compact. 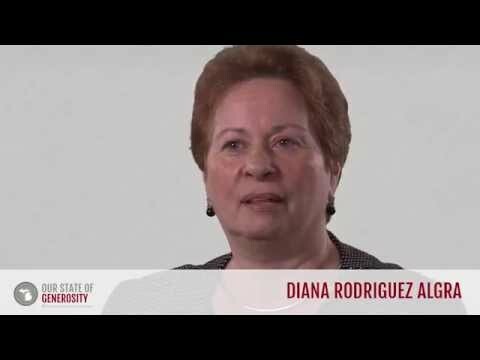 Ms. Diana Rodriguez-Algra talks about the merger between the ConnectMichigan Alliance (CMA) and the Michigan Nonprofit Association (MNA). Ms. Diana Rodriguez-Algra talks about the origins of the Michigan Community Service Commission (MCSC). Ms. Diana Rodriguez-Algra talks about the mission and development of the Volunteer Centers of Michigan. Ms. Diana Rodriguez-Algra talks about the value of putting aside your political beliefs and truly listening to people who think differently than you. Ms. Diana Rodriguez-Algra talks about mentors in the Michigan philanthropic network who inspired her work and personal philosophy. Ms. Diana Rodriguez-Algra talks about how strong interpersonal relationships helped Michigan's philanthropic infrastructure flourish. Ms. Diana Rodriguez-Algra talks about how the willingness of leaders to take risks created a unique environment for philanthropy in Michigan. Ms. Diana Rodriguez-Algra talks about how the W.K. Kellogg Foundation encouraged the development of philanthropic initiatives in Michigan. Ms. Diana Rodriguez-Algra talks about the creation of the ConnectMichigan Alliance. Ms. Diana Rodriguez-Algra talks about the importance of embracing diverse voices in the philanthropic community. Ms. Diana Rodriguez-Algra talks about the next generation of philanthropic leaders and the spirit of entrepreneurial thinking as applied to nonprofit work. Ms. Diana Rodriguez-Algra talks about her work with AmeriCorps and the Corporation for National and Community Service. Ms. Diana Rodriguez-Algra talks about how Michigan philanthropic leaders have excelled at communicating the mission of the sector to policy makers. Ms. Diana Rodriguez-Algra talks about the importance of embracing values of diversity and inclusion in the philanthropic community. Ms. Diana Rodriguez-Algra talks about how Governor Romney and the Volunteer Centers worked to create a wealth of human capital. Ms. Diana Rodriguez-Algra talks about the importance of having committed leaders with flexible relationships within philanthropic leadership. Ms. Diana Rodriguez-Algra talks about the remarkable leadership of Governor Romney. Ms. Diana Rodriguez-Algra talks about the value of admitting "I don't know" and learning from the experience of those who came before you. 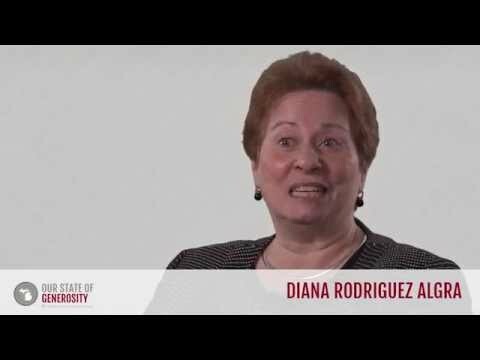 In 1972, Ms. Diana Rodriguez-Algra received her Bachelor of Arts in Industrial Psychology from Michigan State University (MSU). Continuing her studies at MSU, she received a master’s degree in Labor and Industrial Relations in 1979, specializing in Collective Bargaining and Employee Relations. Between 1988 and 1991, she also completed additional post-graduate coursework in Adult and Continuing Education. Ms. Rodriguez-Algra was born the youngest of three children to parents who immigrated to the United States from Puerto Rico. Born and raised in New York City, she did not move to Michigan until the 1970s to attend Michigan State University. Early career aspirations for Ms. Rodriguez-Algra included practicing law and using her degree in Industrial Psychology as an efficiency expert. Straight out of her baccalaureate program, however, she began working with an organization called Model Cities in Lansing, which received a federal grant to improve city transportation. Through this program, she had the opportunity to extend bus transportation to small communities in the area, as well as to evaluate the social and environmental impact of these transportation systems. With her supervisor at Model Cities, Jacqueline Warren, she received a grant from the state to establish a Woman’s Bureau for the city of Lansing. Through the Bureau, she helped displaced homemakers rebuild their lives and enter the job market. She later accepted a position as director of the division of women’s programs at Michigan State University where, for the next nine years, she served her alma mater by designing, implementing, and evaluating programs that benefited women on campus. Despite not initially seeking a career in the nonprofit sector, Ms. Rodriguez-Algra found her way into the Michigan infrastructure by first engaging her local community and then moving up the ranks to serve from a more holistic vantage point. In 1989, she was selected as the first executive director of Michigan Campus Compact. Ms. Diana Rodriguez-Algra first became an active participant in Michigan’s philanthropic infrastructure through her work with the newly-established Michigan Campus Compact. While serving as the first executive director, she worked to instill a sense of civic duty at the organization’s 16 member colleges and universities. One of the program’s early projects provided a series of venture grants to member faculty so a service-learning pedagogy could be implemented. Students were encouraged to engage with their local communities as part of the course curriculum. She also coordinated an annual conference and supported initiatives on public service and civic responsibility. Ms. Rodriguez-Algra later returned to Michigan as a service-learning coordinator for MCSC, where she collaborated with the Council of Michigan Foundations to develop service-learning resources for policy makers and educational leaders across the state. Some of these resources included hosting legislative hearings for state representatives, providing technical assistance to leaders in education, and developing a series of events on the sustainability of service-learning. Throughout her career, Ms. Rodriguez-Algra has improved volunteer infrastructure at the community, state, and national levels. Her leadership has facilitated opportunities for students, public policy makers, and citizens to engage in both the theory and practice of community service. Ms. Algra was interviewed regarding her experiences in working with Michigan’s philanthropic community and the Our State of Generosity (OSoG) partners. The following are selected quotations from her interview specifically related to the five organizing themes of the OSoG project.